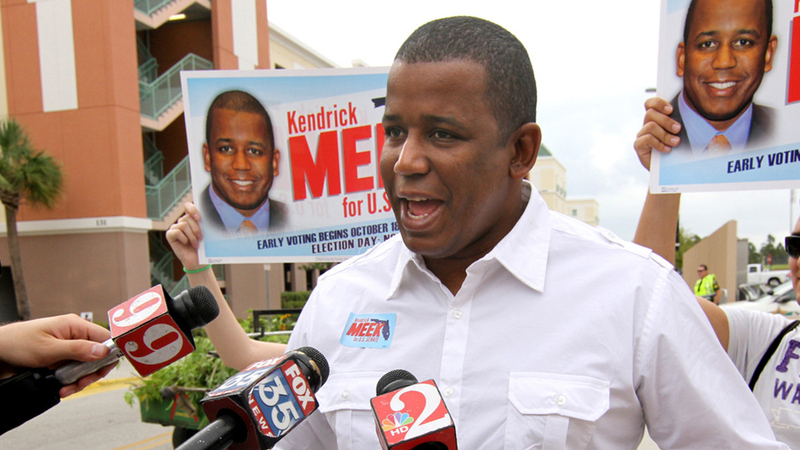 Saying Tuesday that he plans to sleep in until after 10 a.m. and do some fishing Kendrick Meek conceded his bid for the U.S. Senate seat, ending 18 months of campaigning, winning the primary, running in a three-way race and losing to Republican and tea party-backed Marco Rubio, a Cuban American who once served as the Florida House speaker. It also meant giving up his Congressional seat and bidding adieu to the 17th District, which includes parts of Miami-Dade and Broward counties. Frederica Wilson will represent the district in Washington, D.C., after an electoral victory Tuesday. Meek received 20 percent of 5,338,754 votes cast in the senate race, behind the 49 percent garnered by Rubio and 30 percent by Charlie Crist, the former Republican turned Independent. Meek took 30 percent of the votes in Miami-Dade, Rubio, 45 percent and Crist, 25 percent. Crist won Broward County, with 36 percent of the votes cast there, with Meek and Rubio 32 percent each. Not even the name recognition of his mother, Carrie Meek, one of the first three African Americans elected to Congress in the 1990s since Reconstruction, was enough to help his campaign. She joined him, along with his wife Leslie, sister Lucia Davis-Raiford, daughter Lauren and son Kendrick Jr., on the platform as he thanked his supporters Tuesday night at the Rusty Pelican. “Tonight, I stand before my fellow Floridians with an overflowing heart and an uplifted spirit, forever appreciative that people throughout this state believed in our campaign and embraced values that we as Floridians hold dear,” Meek said. Meek also thanked the unions and the faith-based community for their support. By the time polls closed, about 100 supporters, including Miami-Dade Commissioner Barbara Jordan, milled about in the Rusty Pelican ballroom awaiting results. By 8 p.m., local national media called the race for Rubio. When word that Meek had lost trickled to the room, the place took on a somber air. Meek campaign spokesman Nathan Click said he was not surprised by the results but thought Meek did better than most predicted. “In the last few days we saw large increase in key precincts; we saw big turnouts,” Click said. Christina Owens-Charles of Miami came to the watch party to support Meek, who, she said, was a voice for Haiti. “You run for office because you want to serve, that’s why you do it. I couldn’t give up,” Meek said after his speech. Meek had trouble raising money to get his name recognition out to voters even before the primary. Still he was able to grab the Democratic nomination for the vacant senate seat. On Aug. 24, he beat back real estate billionaire Jeff Greene. Meek was dogged by reports that in 2003 his then chief of staff in Miami, Anthony D. Williams, accepted $13,000 for a down payment on a home from a disgraced developer. Also, that his mother accepted $90,000 and payment for a SUV to do consulting for a proposed biopharmaceutical complex for Liberty City from the same developer, Dennis Stackhouse, who is accused of stealing nearly $1 million that was supposed to support the project. Carolyn Guniss may be reached at GunissCarolyn@msn.com.